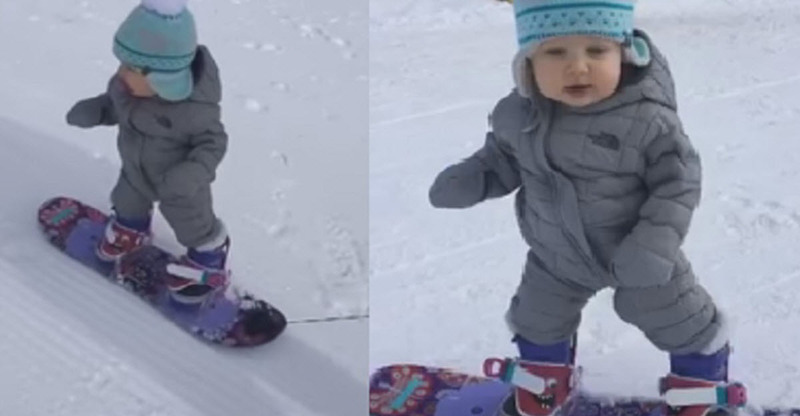 This 14-Month-Old Baby Will Surprise You With Her Snowboarding And Balancing Skills! Home » Cute & Kids » This 14-Month-Old Baby Will Surprise You With Her Snowboarding And Balancing Skills! Parents are always delighted when their babies finally learn how to take their first steps. But for parents Zachary and Katie Henderson, their baby Sloan’s milestone is rather remarkable. At only 14 months, the little girl already knows how to balance herself on a snowboard. Shortly after Sloan learned how to walk, she was able to ride on the board. Both her parents are adrenaline junkies; they play different kinds of sports including surfing and wakeboarding, so you know where her balancing skills are coming from. Zachary and Katie took their little girl to Park City Mountain Resort in Utah one day and they discovered her skills. The little one balanced herself down a small slope without so much of an effort. For Katie, filming Sloan on a snowboard was just her way of getting the kid outdoors and to not dwell so much on gadgets. She never realized that the video would go viral, that it even reached viewers in Hong Kong and Norway. But of course, any parent would be so proud of Sloan’s milestone. See? Even her mom was jealous. You should be, too! Katie also said that Sloan may have inherited her balancing skills from her dad, but her penchant for the outdoors comes from both of them. It would still take several years before Sloan can officially compete in a snowboarding competition or even play with the board by herself, but both Katie and Zachary are fully supportive of her.